We kick off our gallery of VR/AR Projects with this fabulous forecast of VR by MIT engineers. The Next 30 Years of VR is a project developed at MIT Medialab by former research scientist Barmak Heshmat from Camera Culture group. The project consists of an exhibit on 7 dominant trends in the next 30 years of Virtual Reality. The authors developed a visual brainstorming where they present the next 30 years of VR in a set of concept designs. Barmak developed a handful of sketches. Here you can see some of them. 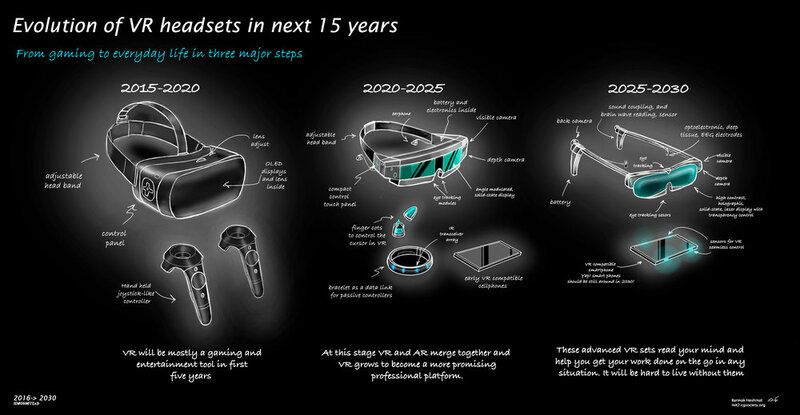 In the first one Barmak envisions the next years of VR headsets [Figure 1]. The second one is focused on phsycology and human behaviour to forecast how the setup for a VR experience will look like in the future [Figure 2]. On the last picture we can see Barmak preseting his work at MIT Medialab's Camera Culture group. Barmak Heshmat is a research scientist at the Massachusetts Institute of Technology. He leads the ‘inverse problems in light propagation’ subgroup in the Camera Culture group where they develop tools and solutions for imaging beyond conventional limitations of optics using ultrafast optics, nano optics and computational methods. Barmak has given invited talks at five TEDx events, NASA’s cross industry innovation summit, and numerous other venues and academic institutions. Barmak is also the cofounder of the 'Imaginarium of Technology' (iMT) which is a platform for sharing engineering ideas. If you are interested you can follow him on Facebook or Instagram. Julia Sourikoff came to MIT to tell us what makes VR storytelling great and how can we achieve good and impactful results with just a bit of creativity. Sourikoff is Head of VR at Tool of North America. Before joining Tool, Julia helped launch the annual Future of StoryTelling summit in New York, growing the company from a small start-up to an exclusive and oversubscribed thought-leadership event with an online presence of over half a million followers. At FoST, she specialized in content curation, partnership development, and experience design, working closely with the world’s leading brands, like American Express, General Electric, Google, Microsoft, and Time Warner. Sourikoff talked about why is VR a powerful medium to communicate and create experiences. One of the quotes she highlighted was 'The computer offers a thrilling extension of human powers' by Janet Murray, Hamlet and the Holodeck. Sourikoff mentioned the 8 phases of enlightment and how with VR we are not watching the world but experiencing it. Sourikoff went through some technical aspects of 360 filming and designing and how could we achieve a good result with the tools we have in hand. She explained the areas of interest in a 360 experience. She talked about the difficulties that one can find when filming and editing in 360 and how to overcome those. She also talked about the importance of testing and iteration when filming in 360. Finally she explained how VR is evolving and how we will use it in the future. She talked about different mediums that are getting importance amongst VR specialist such as WebVR. It was great to have Julia at MIT. We had a great evening with massive attendance and food!! It was an incredibly interesting talk full of little tips for all of you who want to start digging into this great medium! Don't miss our next talk at MIT! Last week 14 students from Princeton Envision visited the MIT Medialab and had the chance to check out the newest VR/AR projects that are being developed by Medialab researchers. Princeton's leading student organization in rapidly developing disruptive technologies and their wide-ranging implications, Envision had the privilege of sending 14 students to visit MIT's Media Lab and Fluid Interfaces Research Group with human-computer interaction expert Judith Amores and VR@MIT Co-Founder Jacob Loewenstein. Fascinated by the innovative output of the Media Lab's various research groups, Princeton Envision students learned about the industry applications of Affective Computing, development of smart cities through Changing Places, far-reaching benefits of Biomechatronics research and inventions, as well as the myriad ways in which Fluid Interfaces is impacting the AR and VR industries. Amores's clear explanation of how different VR/AR projects can be applied to education, meditation training, building of user empathy, artistic imagination, communicating sensation, and other fields inspired many of us to consider potential applications and get excited about the reality of seemingly science-fiction inventions. Provoking multiple conversations about both business ideas and technical innovations, our tour and talk with Amores and Loewenstein was by consensus the highlight of our trip, leaving many of us in awe and in pursuit of the Media Lab as a potential future goal destination. From my short visit, I could tell that the MIT Media Lab is a remarkable and incredibly unique place: the projects are groundbreaking and audacious, the mindset required to effect them is truly "antidisciplinary" and the environment is conducive to much-needed research and development that couldn't be done anywhere else. We were really happy to host the Princeton Envision students and show them the different VR/AR research being developed at MIT. If you are interested in knowing about the VR/AR projects at MIT contact us and we will offer you a visit to check out the latest advances in VR/AR technologies.